The Sheldon Jackson Museum invites the public to sign up for an imitation gut skin sewing class with artist-in-residence June Pardue (Alutiiq/Inupiaq). 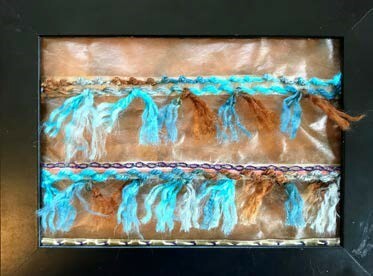 During the class, students will have the option of using imitation gut to make a small decorative wall panel or a dream catcher-like piece of art. Classes will take place in two parts from 10am-1pm and 2:30pm- 3:30pm on the following days: Fri., May 17th, Sat., May 18th , Fri. May 24th, Sat., May 25th , Fri., May 31st, and Sat., June 1st. Students should attend all classes and will share their works of art with the artist in an informal presentation to the public at the museum on June 1st at 3pm. Students can register by calling the museum at (907) 747-8981 or by coming to the museum in person. A $20 payment in the form of a check should be provided to the museum at the time of registration. The $20 goes to purchase the imitation gut material and is non-refundable as materials must be ordered in advance of the class and cannot be returned. At the time of sign up, students will be provided a short list of materials (scissors, thin yarn, cotton balls, etc.) to bring to class. June Pardue, an Alutiiq and Inupiaq artist, lives in Sutton, Alaska and is originally from Old Harbor on Kodiak Island. Pardue began waving at age fifteen and today, works mostly in beach rye and sedge grass. She also makes beaded headdresses and regalia in the Aleut or Unangan tradition. Her work is in private collections as well as in the Alutiiq Museum, the Baranof Museum, Alaska Native Heritage Center, and the Sheldon Jackson Museum. She will be in residence at the Sheldon Jackson Museum from May 15th until June 5th and creating art in the gallery most days from 10am and 1:30pm-4pm. To find out more, call (907) 747-8981. The Alaska Native Artist Residency Program is sponsored by the Friends of Sheldon Jackson Museum and made possible with the support of the National Geographic Lex-NG Fund, which funded the program in 2018 and 2019, the National Endowment for the Arts, Alaska Airlines, Alaska Arts Southeast Inc., other local arts organizations, volunteers, and the general public. If you are interested in supporting the Alaska Native Artist Residency Program, you may call (907) 747-6233 or visit www.friendsofsjm.com .